I smell fresh green grass!! 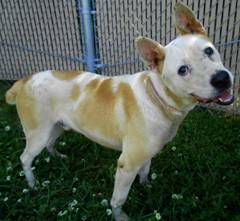 Tiger is a 5 yr old male blind Carolina dog that was an owner surrender at Lincoln Co Animal Control in NC. Before being surrendered, Tiger lived on a chain for 5 years. 1-2 years ago, he was attacked while on that chain by something and he became blind as a result. The owner did nothing.The owner just left him on that chain. Skip a few years ahead and the owner dumped him at a kill shelter. Sylva Southwell with Believe in Buster Animal Rescue offered to help him. She transported him ON 5/26/13 from NC to VA and he's currently with her now. Following is her update on this precious boy. We have renamed him Tyler. 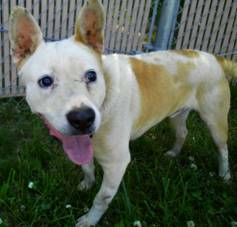 We're now looking for Tyler's forever home or a Special Needs rescue group for help. Tyler is a friendly and gentle little guy. Sylva reports that he loves human attention and loves belly rubs. He seems to do well with his blindness and is not timid at all. He is very, very friendly! He has a scar on one of his front paws which probably was quite deep at some point but this does not impede his walking. He has a half tail that never stops wagging. She reports that he is excellent with people and is quite remarkable. He’s adjusting quite well after being out of the shelter for just one day. Now we have NO offers for poor Tiger. Please continue to network him with proper criteria in place if he is to leave here. Since he is now not leaving. I will schedule a vet visit for him in 10 days. I have to wait until his quarantine time is up. My vet prefers it and I do not blame him. Unless it is a medical emergency I always quarantine dogs before wellness exam, blood work, hw test and sterilization. If he is HW positive my vet charges $300 - $350.00 for treatment and kennels are $229.00 10x10. I thought I would just get it out of the way as to what approximate expense is. This evening I spent approximately 45 minutes with Tyler. He LOVES attention :) I brushed him for a bit which he really enjoyed, probably the first time he has ever been brushed by his initial reaction after I let him sniff the brush. He enjoyed his brushing session so much that he closed his eyes. And it was nice to get that excess loose fur off of him. He has a very cute and animated nature about him. He is not timid, actually a very friendly boy. He has a scar on one of his front paws which probably was quite deep at some point. It does not impede his walking. That half tail of his never stops wagging. He is excellent with people. Being blind and in a new place it is a pleasant surprise how sweet and friendly Tyler is. Someone is hopefully going to end up with a remarkable little boy. Donations can be made to Believe in Buster Animal Rescue, a 501c3 group by visiting their website, or via Pay Pal (Their paypal address is st2005@embarqmail.com), or you can visit their Facebook page to access their donation section. Your donation is tax deductible. We're asking the community to spread the word about him in hopes that we can find the perfect family for him, or a Special Needs Rescue group that can help us find his family. 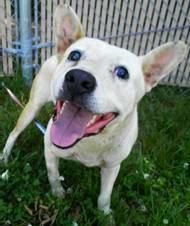 Tyler has been on a chain for all of his life, yet he loves people and is very trusting. His whole story is just heartbreaking to me. I want to help him find a wonderful family! Please share his story!!!! HELP HELP HELP! Little Tiger, blind and running out of time. Little Tiger, photos attached, has spent his life on the end of a chain. Hes a 5 yr old unneutered male. At some point in his life, he was attacked and his injuries were obviously left untreated. The owner dumped him at the Lincoln Co Animal Control in western NC. Ryan Curry, an employee of the shelter has been reaching out to everywhere to try to save him. He reports that Tiger is gentle and gets along well with other dogs. Its a shame to think about, but being at AC where hes getting attention, food and shelter from the AC employees, is probably the best that hes ever been treated. Regardless, he is at a kill shelter, and his days are very, very numbered. Original Post: This is Tiger. He’s a 5 year old blind Carolina dog. His owner brought him in about 2 days ago. Him being blind, the shelter is really overwhelming for him. We take him out a lot and let him relax outside where it is quiet, but he really needs to get somewhere more sensitive to his situation. If anyone can help, or you know someone who can, please let us know so we can help him out. Thank you all again.